Affordable Oslo... sounds like an oxymoron doesn't it? Scandinavian countries are expensive. Norway may just top the list. So what can you do so you can afford to visit this picturesque and lively capital? For one thing, get outside. The Norwegians love outdoor activities... so join them and wander in Oslo's parks for free. The whole historic harbor area is a lively scene. The beer may be expensive, but you can sit and enjoy it for as long as you like. Use public transportation not taxis. Start by getting the shuttle train in from the airport. You can buy a 24 hour pass for the public transportation system. The Oslo Pass will give you free admission to more than 30 museums and attractions in Oslo as well as free public transportation and ferry rides for the duration of the pass. There are discounts on dining and shopping. It even includes a lunch cruise tour.... how's that for a free lunch! 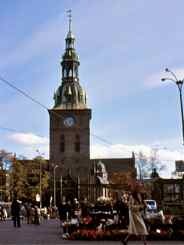 This is an all day tour by bus and boat that shows you the main sights around Oslo and includes a seafood buffet. The Oslo Pass is offered in 24, 48 and 72 hour lengths. If you want to see as much as you can in two or three days, this is your ticket to affordable Oslo. You can buy the Oslo Pass online or when you get there. The card is valid from the time you stamp it at your first attraction or ride. You could spend several hours at the Folk Museum. 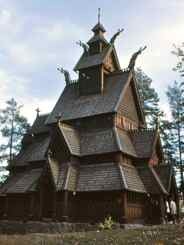 We had pictures of this Stave Church on our wall for years. Oslo is a compact city, so it's easy to get around to most sights by walking... and walking is certainly affordable. Wander Karl Johans Gate (Street). Admire the Norwegian Parliament, the University, and the Akerhus Castle. This is a good street to window shop on, but since we're looking for affordable Oslo, this is no place to be buying. The National Gallery is free. You'll want to go there to see Edvard Munch's "The Scream" and other major works... talk about iconic Norwegian art. The museum is closed on Monday. Visit the fish market. Laksen Fisk and Vilt. It's a great place to get a cheap lunch. Pick up some smoked salmon, cooked fish or prawns. You can pick up some bread or lefse (Norwegian flat bread... kind of like a tortilla) from a bakery or supermarket. Affordable Oslo on a platter! If you're looking for a cheap meal in a restaurant, your best bet will be to go ethnic. Most travelers want to eat typical dishes, but Indian, Thai and Vietnamese restaurants are cheaper than those offering European fare. If you do want Norwegian fare, look for a restaurant called Dovrehallen (at least when we were last there). It serves up traditional and cheap Norwegian food... things like stews and boiled or fried fish. It's a bit out of the way, a brisk walk from the Domkirch, but then you'd expect to have to look for a cheap restaurant in Oslo. 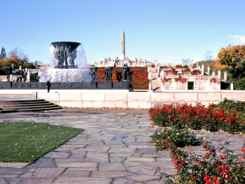 The Frogner Park and Vigeland Sculpture Park within it are free. Vigeland Park contains more than 200 sculptures by Gustav Vigeland, and the park is pretty to walk in. You'll be sharing it with lots of Norwegian families. For small change by Norwegian standards, you can rent a sled and try the Korketrekkeren - The Cork Screw. The sled rental is about US$10 (60 Kroners) and you can sled down the bobsled run from the 1952 Winter Olympics. Amble through the Royal Palace Park. Watch the Changing of the King's Guard. It takes place everyday at 1:30 PM. The entire Changing of the Guard takes about 40 minutes. Walk the waterfront and picnic. In short, do what the Norwegians do to make Oslo affordable!